I had a chance recently to get a hold of Matteo (a.k.a. EraSer) just before his departure for the Bent Festivals that are spanning three back, to back, to back weekends in the States. I’m always curious on the whole traveling with gear to a foreign lands thing and how smooth it goes…or how chaotic. I think this is the first time many artists not from the States will be descending upon 3 major cities within the U.S. to cause random glitches, noise bleeps, and pure electric excitment, all around the same time frame. EraSer is making the trip all the way from Italy! Q: What is going through your mind as you get close to taking off for the U.S. to play 2 of the 3 Bent Festivals? EraSer: I’m so excited by the idea of taking part in the bent festival. I have always dreamt to play my music there. Q: Have you thought about getting your equipment inside the U.S.? EraSer: Yes, I’ll bring with me most of my equipment :(……. which includes: Casio SK1, Casio sk5, Grillo Parlante, Talking Calculator, and a toy drum. Q: What are you imagining the trip will be like? EraSer: I’m sure it will be one of the best trips of my life. A unique experience. Q: Do you have all of your travel arrangements made? EraSer: It’s all quite ready. Just making sure everything is done. Q: Is there anything anyone can do to help you out in any way? EraSer: The staff of the festival is so great! They are so friendly and they’re supporting me in everything…in order to organize the trip in the best way. Q: What are your plans for down time when your not at a festival? EraSer: Of course I’ll visit the cities that will host me for the festival, and I’ll look for shops where to find stuff ready to be modified on my comeback in Italy. 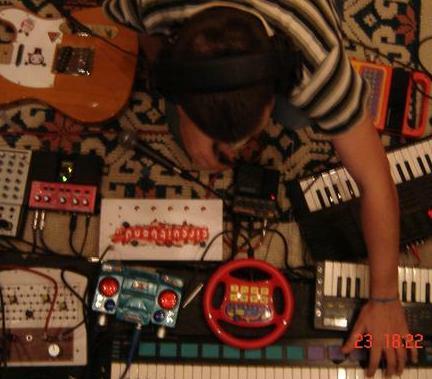 I also hope to have the chance to play with other circuit benders out of the festival. Q: Are you looking forward to meeting anyone or seeing a certain person play? EraSer: I’m looking forward to meeting all the bent fest staff and all the circuitbenders. It will be a great emotion seeing all the performers play. Q: You also run www.circuitbend.it an Italian circuit bending site…When did you start that? EraSer: I created it 2 years ago when I realized that it was necessary to involve more and more persons in the circuit bending world. It is a site where people can learn how to get a start with this enchanting art through news, tutorials and bent stuff. Q: Anything else you want to add? EraSer: I want to thank you for this interview ; ) …. and I want to thank the organization to give me the chance to realize my dream of playing my circuit bent music at the Bent festival.